Campaigners outside William Patten Primary School earlier this year. Photograph: Clean Air for William Patten. 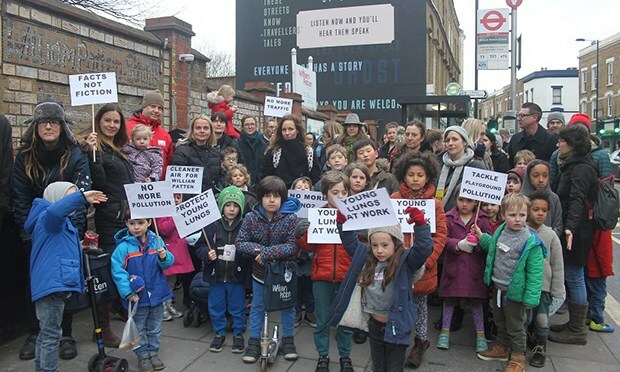 Hackney’s Mayor has disputed the idea that controversial proposed road closures in Stoke Newington would necessarily lead to a spike in air pollution near William Patten Primary School. Mayor Philip Glanville stated that the council remained attuned to the “absolutely legitimate” concerns of William Patten parents, and defended the motivation of the proposed closures as a council attempt to reduce traffic flow in the area. Recent draft figures from the council have shown that the closure of Walford, Beatty, Brighton and Barbauld Roads could result in 2,080 vehicles passing William Patten and St Mary’s schools, rather than the 564 vehicles initially projected. Speaking exclusively to the Hackney Citizen, Mayor Glanville said: “I think there are absolutely legitimate concerns from the school community, and I think we’ve been very clearly saying that we recognise those, and want to work with the school around the broader look of air quality there. “I just do not accept the idea that we don’t care, or that we’re not listening, or that we don’t have any ideas about how to reduce air pollution at that school. “I don’t think it’s a zero-sum game. I think the people in that community that are saying that one thing will necessarily lead to another – as a politician, I don’t accept that. “We’re still looking at the evidence base. They’ve got an evidence base, we’ve got some, the Greater London Authority (GLA) have others – all of that will go into the decision. The Mayor went on to describe the mixture of different measures employed by the council to tackle poor air quality across the borough, including school street schemes, traffic filtering, and direct capital investments in green wall planting, as well as ‘big ticket’ policies such as ending the use of diesel fuel, rolling out green buses and encouraging fewer journeys. The Mayor also voiced his disagreement with a recent ITV news report on the campaign against the proposed road closures, which he felt did not fairly represent council policy. Referring back to the debate over licensing restrictions earlier in the year, in which the council claimed misinformation on the impact of council policy had been spread by campaigners, Mayor Glanville added: “I’m not sure you can consult your way out of this debate, because it is different views. “It’s also a bit like the licensing debate, and I wouldn’t necessarily go as far as some have said, but if you presented me with a petition that said, “The council is going to increase air pollution outside of your child’s playground,” you would sign it. It was pretty stark. “If you look at how the ITV report was written up, it was the idea that, ‘the council’s plans would lead to an increase in air pollution outside the school’. In direct response to the Mayor’s remarks, the CleanAir4Schools group stood by their concerns over air quality on Church Street, and called on the Town Hall to meet with the group to discuss the road closures. CleanAir4Schools campaigner Matt Petzny said: “Pollution levels on Church Street are already over the legal limit. The GLA’s air quality audit at William Patten stated that the whole school site is over the legal limit for nitrogen dioxide and suggests closing a section of the playground. “The council now concedes its road closures could increase traffic on Church Street by 21 per cent which is significantly higher than the ‘at worst’ 5-7 per cent stated in their consultation. “Many people – parents, business owners , residents and experts in air quality and respiratory health – are worried that kind of increase in traffic can only worsen pollution and road safety there. Parents in the area remain concerned on the potential detrimental impact to their children’s health any increase in traffic caused by the closures could bring. Parent Matt Dillon said: “Our son has had respiratory problems for several years – few things can be more frightening than watching your child fighting for breath. “He had pneumonia a few years ago and was admitted to a hospital – we have been advised that pollution could well have been a cause. The mayor’s comments come as paediatrician and air pollution expert Professor Jonathan Grigg added his voice to campaigners’ concerns on the potential impact of a 21 per cent increase in traffic in the area.